There are so many options for haircare nowadays that it can get a little overwhelming – especially if you’re a product junkie – so having someone do the work for you at a fraction of the costs makes this so much easier. Seeing as there are a lot of great products that are not available north of the border, the premise of services like CurlKit and Curlbox totally sweetens the deal. Like other box subscription ideas, these companies send boxes containing different hair product samples monthly and you can unsubscribe when you have found products you like. These kits could actually also be a great gift if you’re looking for something for that product junkie in your life, especially if you want to continue the subscription but know you’ll receive items you won’t use. 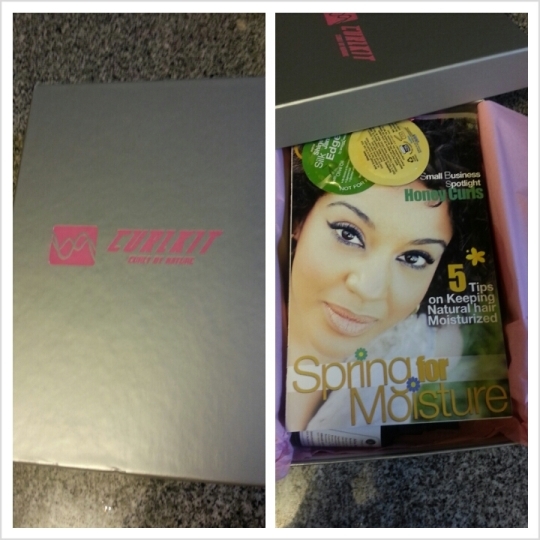 I’d known more about curlBox although I had started following CurlKit on Twitter and Facebook last year, so I jumped on trusty YouTube to see what everyone was saying. Most were subdcribing to both and seemed to be equally impressed. Some however did praise CurlKit a bit more on the products they’d sent, so I made a mental note. In perusing both their sites (both charge $20 US for their subscriptions), I noticed that CurlKit sends 6-9 product samples while curlBox sends 5-7. Another mental note. I also noticed on CurlKit gave a discount code if you were following them on Facebook. It started to become apparent that my decision was being made for me. What finally pushed me over the edge, was when I tried to sign up with curlBox, I got notification it was sold out. Okay well then – CurlKit it is! Once I’d placed the order (it costed $37.95 CDN including shipping), I started looking out for their tweets and Facebook updates. The more I read the more excited I got, especially when they announced a “spoiler”. 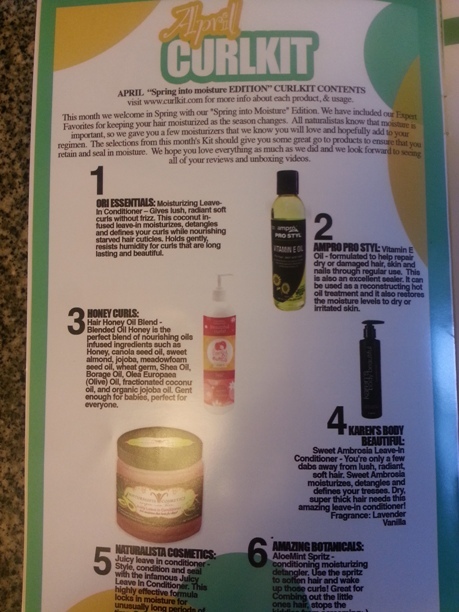 April’s subscription was going to include both Naturalista Cosmetics Juicy Leave-In conditioner and Karen’s Body Beautful Sweet Ambrosia leave-in conditioner; can I just tell you that I almost spontaneously combusted with excitement?! 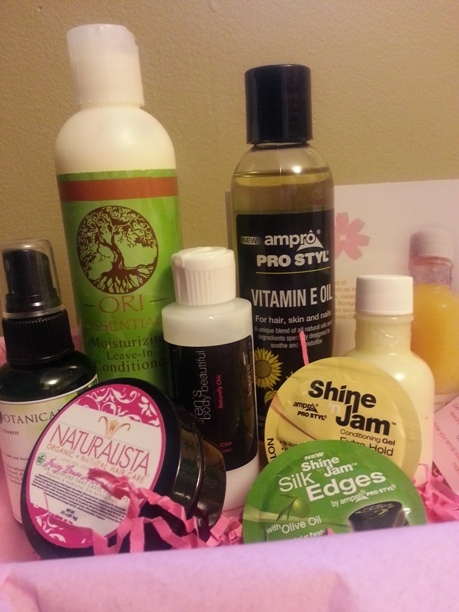 I have read so many good things about these products, and they were on their way to me! The boxes are mailed out on the 10th of every month, and I received mine in tact on the 18th – not bad. The time factor can be so touch and go with items being mailed from the US. I contained myself long enough to open the box, and I was totally pleased. The box is also gives the perfect height adjustment to use my Huetiful Hair Steamer on my table so hoorah for happy coincidences. Now all that’s left is to try the different products and share my thoughts. Have you ever subscribed to CurlKit or even curlBox? If so, did you find items you fell in love with? Share you comments, please! Looks great! I can’t wait to hear about your reviews of this product? Yes ma’am I will. Thanks for reading and commenting! These subby boxes really are a great idea. I love that you get to test drive products before purchasing full sizes. Excited to read upcoming reviews of these products! This is a fab idea indeed! I’m excited to share my thoughts with our readers. wow ok from the pics I have seen online this box definitely looks like it has way more products than Curl Box FRO REAL ( like what I did there? lol) really impressed!! still itching to try Karen’s Body Beautiful, i’ve heard so many great things!! Charm my twa is loving the curlkit subscription! I will do a review on the products for sure. Thanks for reading and commenting! Thanks for the info Chris! One question – is it called CurlKit because the products are for curly hair? I have a little bit of wave to my hair and always try to use curl-enhancing products when I can to try and turn my frizzies into sleeker waves. Hi Seph – the products are made particularly for naturally curly (or relaxed) hair, but I think they can be used on wavy hair type as well since they’re mostly natural ingredients. So depending on what you’re looking for, you can find a benefit for your hair. It really depends on your hair more than anything! Thanks Reva! I’ve been wondering if I made the better decision when I went with CurlKit, so it’s good to know someone else’s thoughts. I will definitely check out your site. I did one review already 🙂 Thanks for reading and commenting!